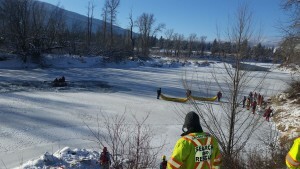 Nelson Search and Rescue was called out Dec 30th for an unknown male subject that was witnessed struggling for survival in the Kettle River ice just east of Grand Forks. Grand Forks Fire, Grand Forks SAR and RCMP were first on scene and called for the assistance of Nelson SAR who flew one special resource member to the scene and a swiftwater team followed to aid in the rescue. Before special resources could arrive on scene to aid the unknown subject he was lost to the river. It is unknown how long the individual was in the ice before his calls for help were heard but it appears to be some time. The search for the man was called off after dark as the conditions were unsafe for rescuers to continue. One the morning of the 31st further special resources from Nelson, Oliver / Osoyoos and Penticton SAR were brought in to aid in the search as well as the RCMP dive recovery team. Around 10:30 am the subject was located in the river by SAR ice rescue teams and the RCMP dive team was able to recover the subject. The subject and investigation has been turned over to the BC Coroners service. Travel on frozen ponds and lakes needs to be 4” or grater to support human loads safely, river ice can be very unpredictable due to moving water and melt freeze cycles. It is never safe to walk on or near ramped river ice without training and proper equipment. Please pay close attention to children and pets near frozen rivers.